[B]ut since I attained the state of Sanctification at the age of seven I have never felt the slightest twinge of conscience, never experienced for one second the sense of sin. This explains why Smith became a critic rather than a novelist. The novelist needs at least a vestigial sense of sin in order to be artistically successful. The critic is always glad to cast the first stone. The wife and kids and I were briefly in Seattle last week to celebrate a friend’s wedding. We stayed at a hotel in the University District four blocks from one of my very favorite used bookshops. 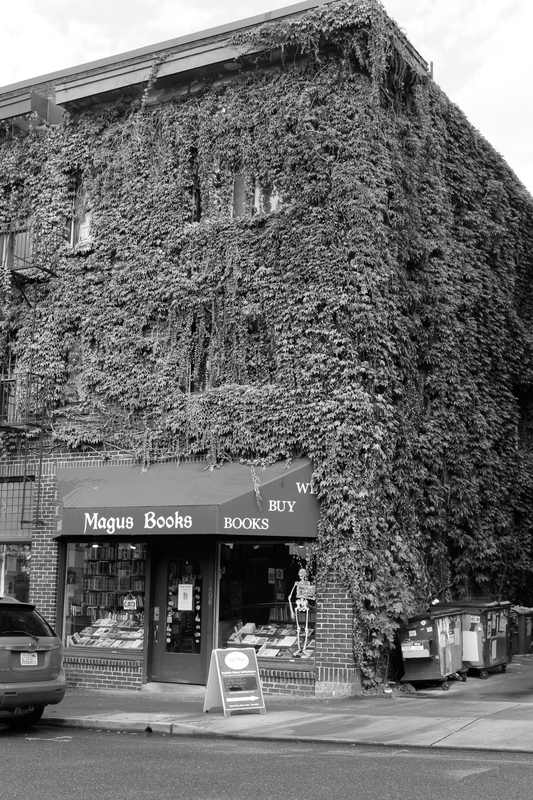 Magus Books, thank God, does not change. With its musty-merry smell, its creaky wooden floors, its barely navigable aisles and long counters and tables piled nose-high with new acquisitions, it was no different than when I first discovered it twenty-three years ago. I seem to have been almost inactive here for a few weeks. Unfortunately I have not been holed up in a hermit’s forest cave with my books and a bottle of scotch. Too much work rather than too much leisure is the culprit, and when I do find some free time I can’t bear to spend it pecking at a keyboard or staring at a screen. I do plan a glorious return. Hopefully that happens soon. But she had been a person to him, and the unbearable pathos of details and habit stabbed him with all the small daggers of bereavement. Early this week I learned of the death of D.G. Myers. He was an occasional reader of this blog, which I considered a great compliment. I was a very dedicated reader of his, which was no compliment at all but only his due. I didn’t really know him. I knew only that part of him which he communicated by words. Looking over those words again I nonetheless feel the small daggers of his loss. He was a person to me.